What does your church think about your preaching? I tend to think my sermons are easily understood by the church. I work to make my messages as clear as possible. I believe my style of delivery is good and I try to get out of the way of God’s Word and the Holy Spirit when I’m preaching. That’s what I think. And that’s probably what you think about your preaching. But what do the people think? What does the church think about our preaching? How do they understand the message? Is it clear? Do we present the Word of God so that He can use the message to bring change, repentance, and hope? The whole purpose of preaching is to make God’s Word clear to those we’re preaching to. If the message is not clear we are not successful in our preaching. We are not preaching to or for ourselves. We are preaching to others. God has called us to preach to them. So, how can we determine how well our people are receiving our message? One substantial way is to use a sermon evaluation form. A sermon evaluation form is a document you give to a group of people for assessing your message. They have it with them during the sermon and use it throughout your delivery. I was first introduced to this idea in seminary. I took a class where I was required to preach two sermons to the class. Every person in the class evaluated my messages with a sermon evaluation form. I then had to write a summary of the class’s assessment of my sermons. For that class, we were also required to use the form while preaching in a church setting. In my church, I selected five people to evaluate a sermon. I informed them what the form was all about. I asked them for their honest feedback. Their observations using this tool provided me with fantastic feedback I used to improve my sermons and their delivery. I’ve taken that sermon evaluation form we used in class and modified it a bit. If you would like to use it for your own evaluations, you can download it at the bottom of this article. But before you download it, I want to go over the form’s different sections. This will help you explain it to the people you select to complete the form. Of course, it may seem silly to explain what goes here. The person evaluating your sermon writes their name here. But you can, and may want to, make the evaluation anonymous. Some who use this type of evaluation feel they get better and more honest feedback when the person assessing the sermon is not known. You know your people so you can make the decision as to whether the evaluation is anonymous or not. This section is for evaluating your reading of the Bible text used in your sermon. It is important that people open their own Bibles and read for themselves. Did you announce the Bible passage? Did you give them enough time to get to the passage before you read it? Did you tell the people what Bible version you’re reading from? Announcing the Bible version helps clear any questions when the passage you are reading doesn’t match up with someone who may be reading from another version. These are both important items to include in your sermon. This puts a spotlight on the Bible and its authority in the message you are delivering. How well did you read the Bible passage? The quality of your reading is important. Looking up and making eye contact with the congregation engages the people with your reading. The sermon introduction is where you initially engage the people. This is your opportunity to grab the church’s attention and draw them into the message. Does your introduction arouse interest? Are you conveying the main idea and direction of your sermon? You want to connect early with the congregation. You also want to get the main idea of the sermon near the beginning so people know where you and they are going. This section provides valuable information on how well your people grasp this by providing them an opportunity to write, in their own words, what they think the main idea and direction are. When you read the evaluations together later you can see just how well people understand what they are hearing by their responses here. Although this is the largest part of your sermon it is a smaller section of the evaluation. There is really only one question here for those assessing your sermon. Are you interpreting the Bible text correctly? Are you taking verses out of context? What do people think? This section provides a way for them to answer this question, as it appears to them. Now, this would be a place where preachers might want to say, “Well, they don’t really know if I interpreted the Bible text correctly. I’m the preacher and they aren’t. I know better.” That is a dangerous thought. None of us are immune from our biases. Sometimes we have tunnel vision. Never discount what others think when it comes to the Bible. The answers here might also inform you of the depth, or lack of depth, your people have in the Bible itself. This is an important part of the assessment and you will gain valuable insights here. This section evaluates how you deliver your message. We may learn things in this section we are completely unaware of when we are preaching. How was your appearance? Do people like your appearance? How about your hand gestures and movement? Are they too much? Non-existent? How was your eye contact and facial expressions? What are you doing during your delivery that distracts people from what you are saying? I was completely oblivious to one of the habits I used to have while preaching. I didn’t even know I did it until someone mentioned it to me. The habit I had was walking up to the edge of the stage or platform and hanging the toes of my shoes over the edge. I don’t know why I did it. No idea why. But the people who told me about it said it distracted them. Because they were waiting to see if I would fall off! Your body language is important while preaching. This section has to do with your preaching voice, how you are expressing what God has laid on your heart. Was the delivery clear and enjoyable? Was it delivered with force? Was the sermon interesting? What was the preacher’s voice like? Did it add to the delivery and message? How was his grammar and pronunciation? Was the sermon understandable? We have the most important message coming from the most important source. We have the sermon God has led us to preach from His very words He has inspired. It is critical our people are able to understand that message. Our sermon ending should draw everything together and call our people to act on what God’s Word has said. This section lets us know how well we do that. How did the sermon finish? Did the preacher present a clear call to action, an invitation to respond to what God has said? Were you moved to respond to the Lord by the message? Did the sermon conclude or were there new ideas presented that didn’t fit in with the rest of the message? Was there a smooth flow to the ending? We don’t want to lose people at the end. This section lets us know how well we are doing at that. This is the final section of the evaluation. Here’s where people are able to let you know their overall feel for your message. 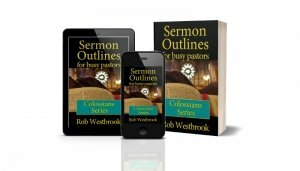 What is one thing the preacher can do to improve his sermon and delivery? Don’t take this as an insult or affront to your preaching. We all have room, much room, for improvement. This question gives the evaluators a chance to express constructive criticism. What they write here is meaningful. What is one thing the preacher did well? Don’t let this go to your head! Seriously, it is always nice to hear what you did a good job on. How did the sermon relate to you? Here’s where we find whether people think the message applies to them and their lives and situations. This is significant. Don’t overlook the answers here. Select four or five people in your congregation. Choose them, looking for diversity. Older, younger, mature Christian, new Christian. Ask them if they would like to help you with your preaching. If so, give them a quick rundown of what the form is and what each item means. Give them the form a few minutes before the service starts. Tell them you would like to have it completed by the end of the message. Before they leave, make sure you collect them all. You may want to spread this evaluation out over several weeks and many people. The more people who participate, the more information you are able to collect. Choose four or five people each week for a month or even two. Once you have the evaluation forms, it’s time to put all the information together into something that makes sense for you. The way I like to do this is to use a spreadsheet. I like Google Sheets <https://docs.google.com/spreadsheets> because it’s accessible from anywhere. And it’s free. Of course, you can use a notebook or any other manual method. For those sections with a number rating, take all the results and average them. This gives you a good way of rating yourself for each question on a scale of 1 to 10. Where are your higher numbers? These indicate the things you are doing effectively. Where are your lower numbers? These point out areas where you can concentrate on improving. The open-ended questions are a bit more subjective. Enter every answer from each person. Then take some time to look them over. Is there a trend in what you see? Are there areas where there seems to be agreement among the answers? Are there answers that stick out? Are there answers that surprise you? The open-ended questions are hard to put a number rating on but they will give you the most insight. Take these answers to heart. Think of ways to improve in the areas suggested. Praise God for the areas where you are effective. Once you have collated the answers, take some time and write out a summary of your findings. I find it helpful to go through this process. As you are writing the summary some things may pop out that you initially overlooked. Set your summary aside for a few days. Then come back and review what you have written. Ask God to give you insight. Have these insights in mind as you prepare and deliver your next sermon. Always seek more effectiveness in your preaching. The sermon evaluation form is one of the best tools to get real feedback on your sermons. The opinions come from the people who listen to you every week: your church. A preacher who holds to preaching as the most important single thing he does will welcome suggestions on how to improve his most significant calling. What’s your take on using a sermon evaluation? Would you feel comfortable using one? What would be your objections? Let us know in the comments below. Download a copy of the Sermon Evaluation Form below. What were the Problems in the Corinthian Church? Sign me up for the Busy Pastor Sermons newsletter!